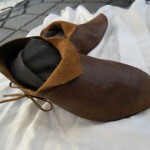 Recently I made another pair of medieval shoes. 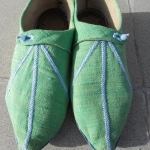 Although they are made as a part of a Bulgarian outfit reconstruction, they are not strictly Bulgarian. 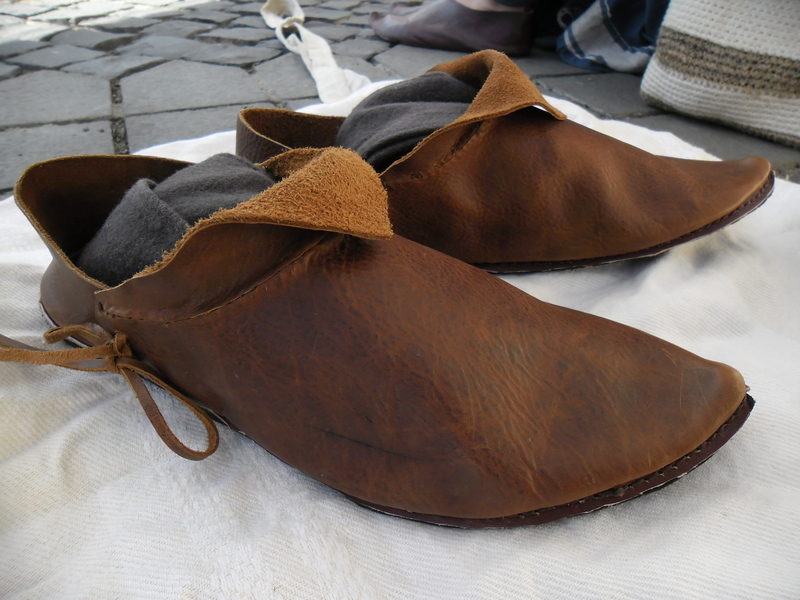 In fact, this is one of the most popular shoe models throughout Europe during the 12th, 13th, and 14th centuries. It’s pretty simple and comfortable. 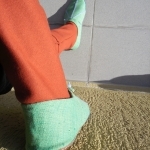 It covers the front of the foot, encompasses the heel and fastens around the ankle, which makes it very comfortable and hard to slip. 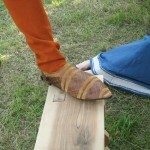 As you can see, this pair of medieval shoes fits pretty tight. 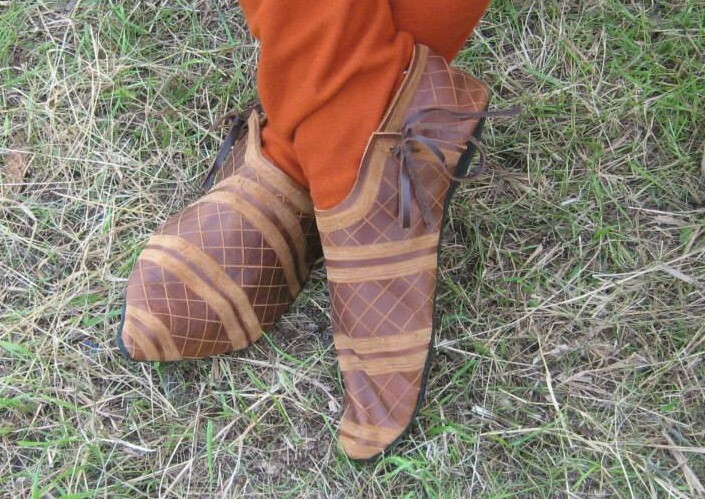 That was a requirement for those shoes, because the owner’s previous medieval shoes were too loose and slippery, which makes walking on wet grass a lot harder and more dangerous. 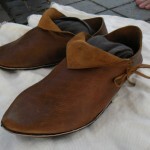 In any case, there are many depictions of such shoes in western Europe. They can even be seen in murals and wall-paintings from the Balkans. (Serbia 14th century) To see the whole gallery, click the image. 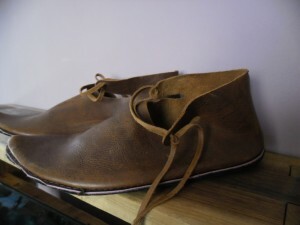 The actual shoes are made of 2mm thick upper layer, and 2 soles made of 5-6mm thick calf leather. 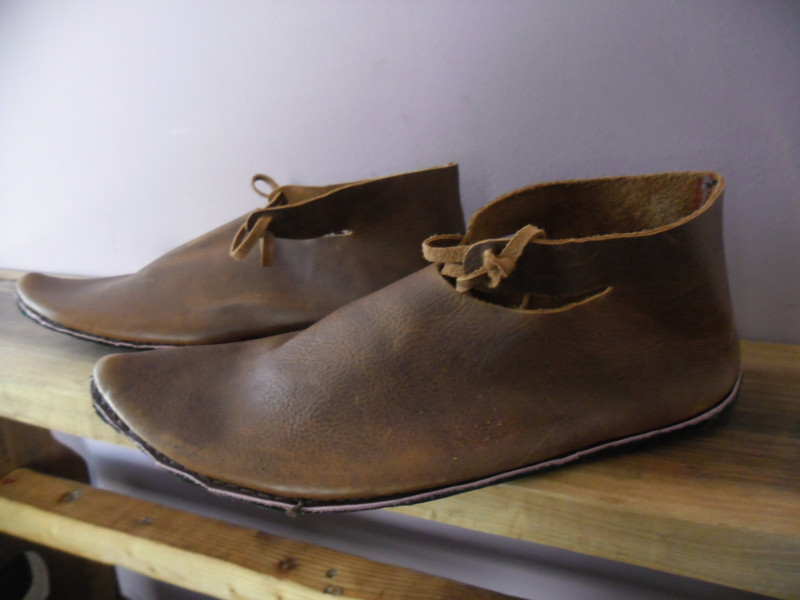 So, they are a bit sturdier than regular medieval turnshoes, which makes them suitable for various weather conditions and terrains. I’m proud of the end results. 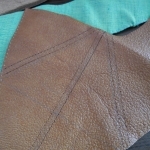 This type of upper leather is very easy to work with, and I’m not surprised that they turned out great. 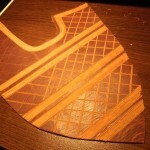 The reconstruction is not done at full scale due to the characteristics of the material that I had to use. 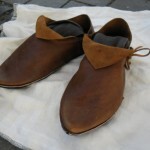 However, I am very pleased with the results, and I think the owner will be happy with his new medieval shoes. 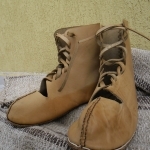 Most shoe depictions on the Balkans are either boots, or low shoes which are commonly worn with wrappings. 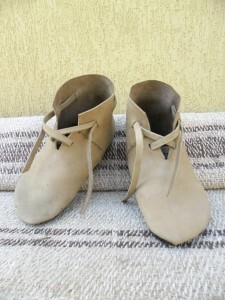 This type of footwear is usually worn by soldiers and common people. This is understandable considering they couldn’t afford more expensive shoes. Cavalry men, on the other hand, wear mostly boots. 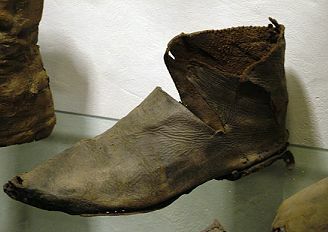 So, it is safe to assume that this type of low medieval shoes were most often used by the medieval middle class. Here are some of the sources I found on this model. They are from present day Serbia and Macedonia. 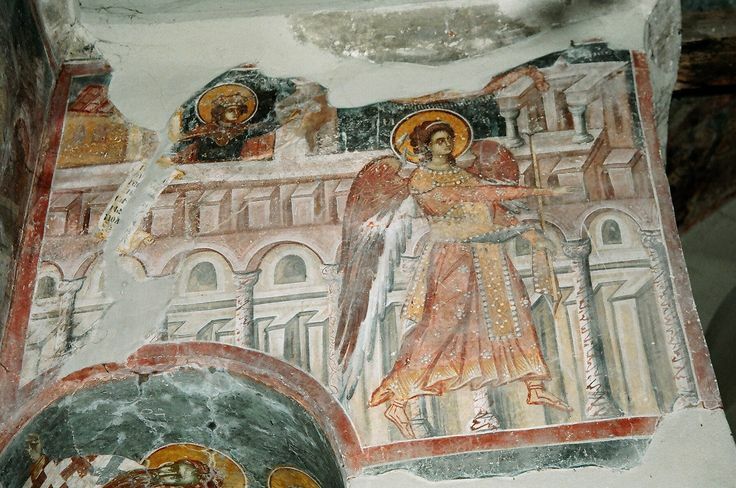 The pictures are from the monasteries of St Andrey church on the river Treske, near Skopie (end 14th cent. ); St Nikita in Macedonia; the churches in Pech, Serbia, and so on. 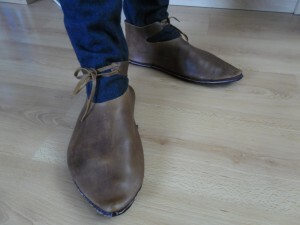 There are various examples of this type of shoes, so I haven’t gone through the trouble of finding all of them. 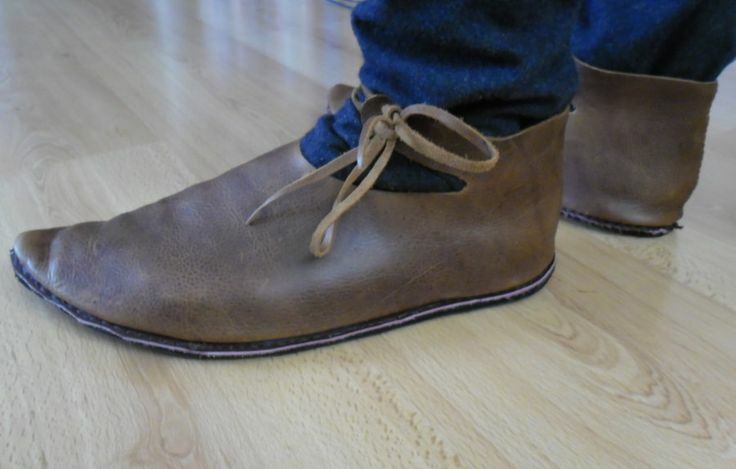 Last year, a friend of mine from Serbia asked to make a pair of good-looking women’s shoes. 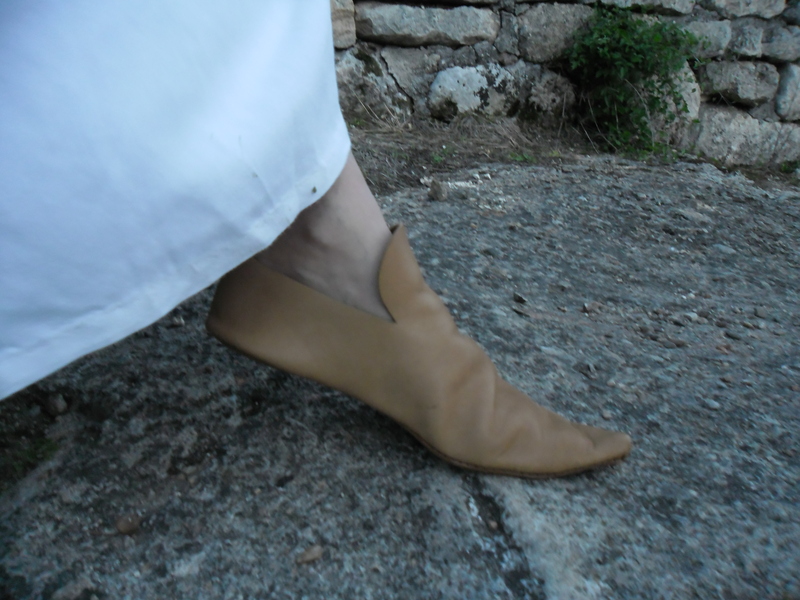 The shoes had to be suitable for a reconstruction of a noble lady’s costume from 14th century Serbia. 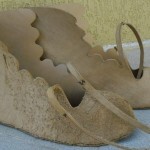 It was a difficult task to find good examples of decorated footwear on the Balkans. However, I did manage to find a lot of images of colored, embroidered and decorated shoes in various wall paintings. 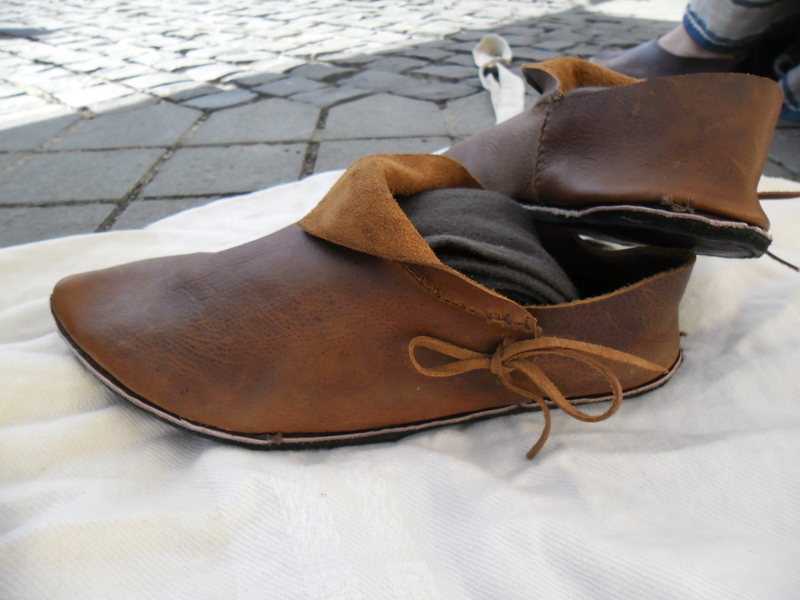 So, based on some of the colors and decorations of the shoes in the murals, and archaeological finds of similar shoes in western Europe, I came up with this reconstruction. 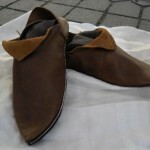 The shoes are made of thin leather upper part, covered with raw silk and decorated with cotton embroidery. The buttons are made of mountain crystal. 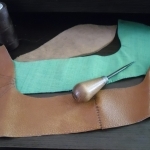 I have also added a protective strip of leather between the silk upper part and the thick leather sole. 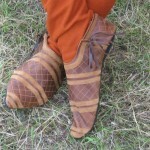 I have seen plenty of late medieval archaeological finds, where shoes have such strips. This is what they look like. I am proud of my work. 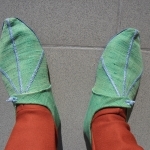 It was especially hard to turn them inside-out because of the shape of the sole, but it was worth the efforts. Here is where I have got some of my inspiration from. Cheers for the lucky lady, and best regards! 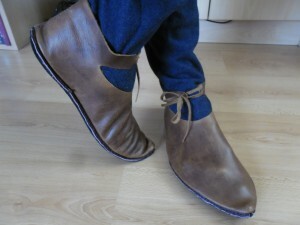 About two months ago a friend of mine called from Ireland, and asked for a pair of viking boots. 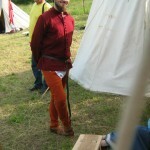 He needed them urgently for a local medieval festival. Needless to say, I rushed to make the boots that he wanted, and managed to send them in time for the event. 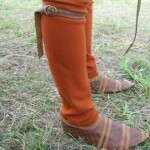 Viking boots from the early middle ages have a distinct design. The front is round instead of pointed. 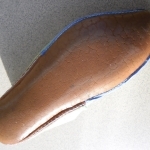 Also, the sole reaches up and covers the heel. 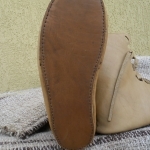 This pair of ankle boots is made of a leather upper part(2mm) and a thick leather sole (6mm). I also added a slip-sole for more comfort. 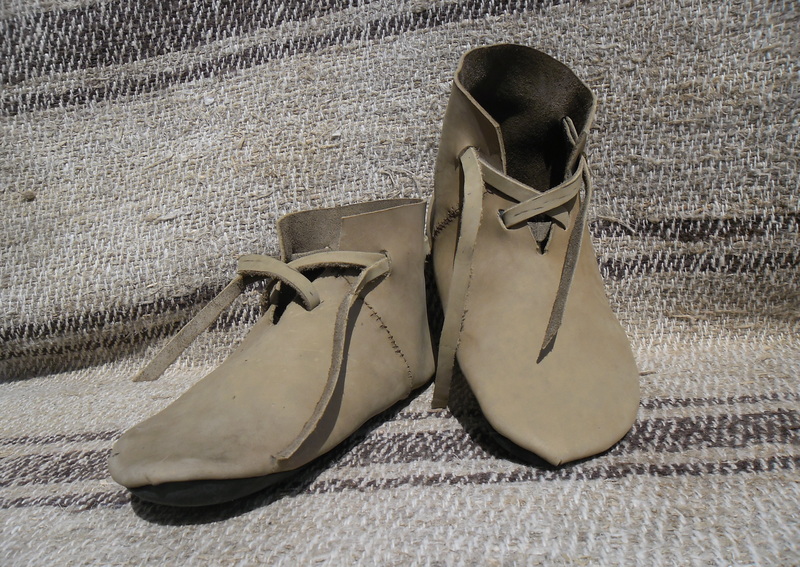 As a professional reenactor, I think that this type of ankle boots should be worn with thick woolen leggings. It’s more comfortable that way. Besides, the leggings can keep you warm and dry when the weather is bad. 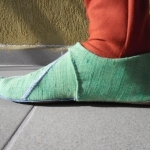 Roman calcei project – complete! 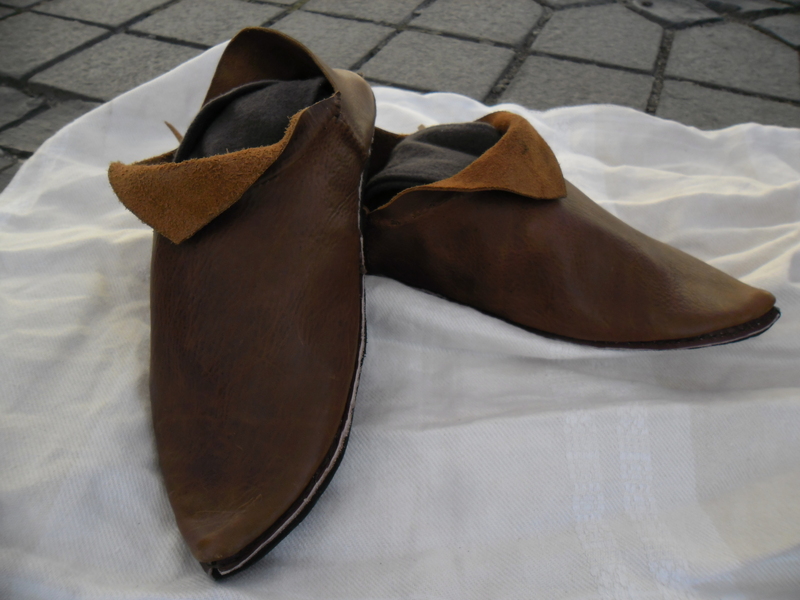 The Medievalisticals team is proud to announce the completion of our first pair or roman shoes! 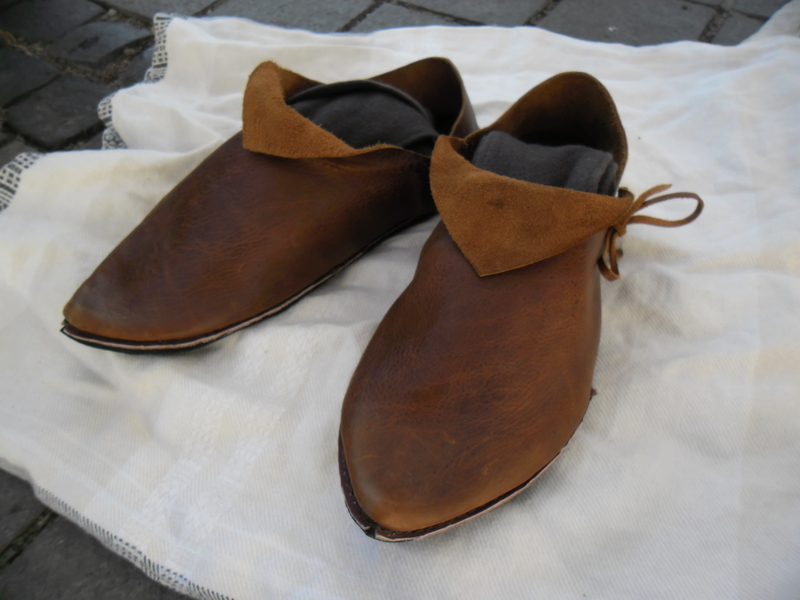 As an experienced medieval shoemaker, I’ve made more than 20 pairs of medieval shoes, but never any roman footwear. 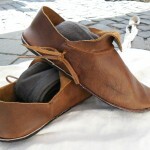 This type of roman shoes is based on archaeological finds from the 5th-6th century. 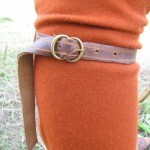 The calcei are a part of a roman military costume that we were hired to recreate for a very interesting local museum in Bulgaria. The museum is based in the municipality of Samokov and it serves as an exposition for archaeological finds from the near roman fortress Belchin. I’m not sure this is the historical name of the place, though. 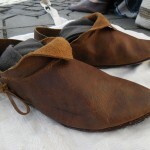 Roman shoes are very different from medieval shoes. They are more complex and in my personal opinion unnecessarily complicated. 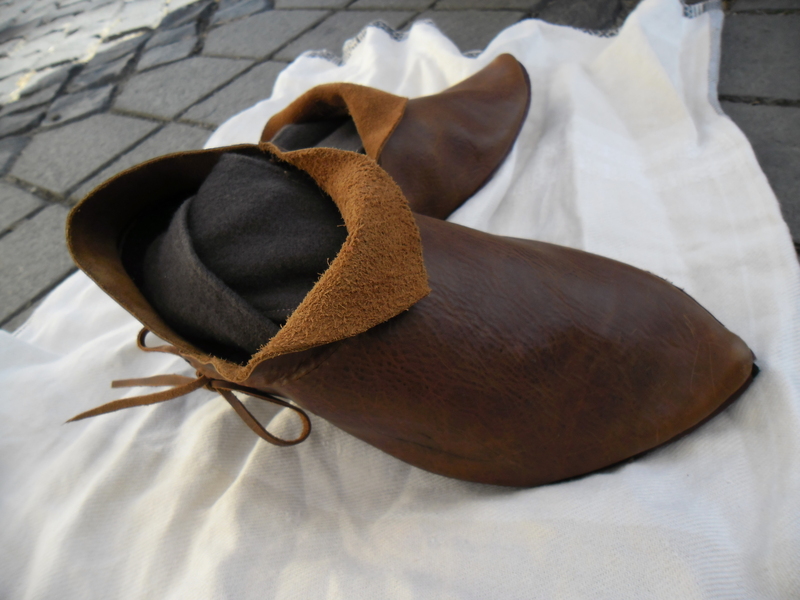 First – they are not sewn on the inside and flipped inside out like medieval shoes(it’s a bit more complicated), and second they have a double sole and hobnails. 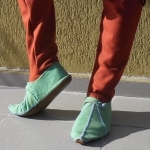 That makes walking with them extremely comfortable. 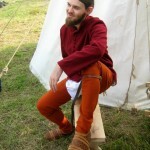 I know that because i tested my double soled boots recently at medieval camp Cherven. 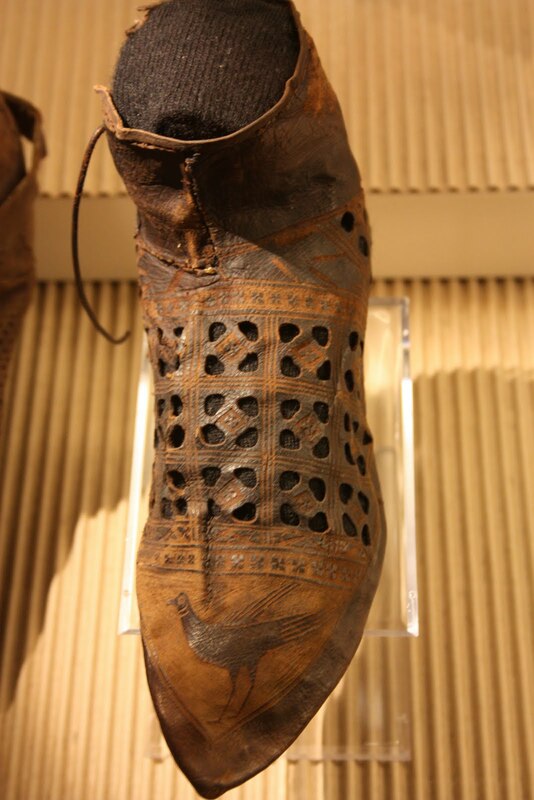 As you may see our example of roman footwear doesn’t have hobnails on the sole, that is because the museum didn’t want hobnails. 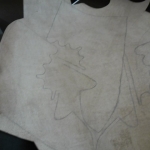 Besides, the boots will be worn by a mannequin dressed with lorica hamata, scutum and everything a 5th century roman legionnaire could need. So a hobnailed boot may cause some damage to the floor, especially with the weight of the weapons and armor. 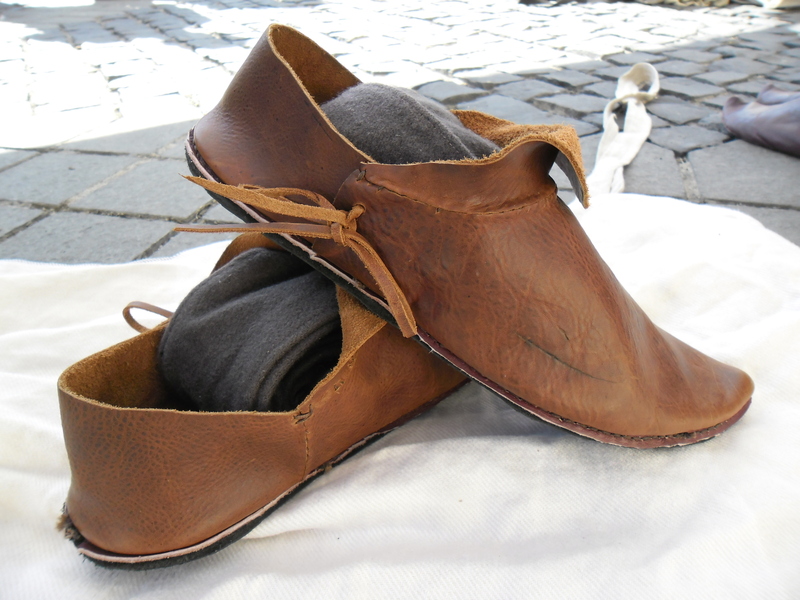 These are exclusively nobleman`s shoes worn by both men and women from western and central Europe from the 12th to the 14th centuries. 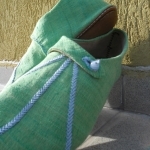 They`re custom made and one of a kind. 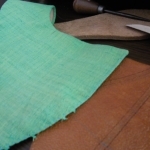 The leather sole is 7mm thick, the upper is 1,1-1,2mm and the fabric is 100% pure silk. 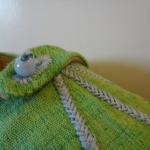 The edge of the upper is enforced with extra stitching and lining to avoid tearing in the fabric. 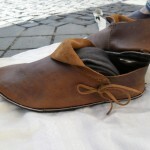 The design and embroidery pattern are based on extant originals and studies on medieval footwear. 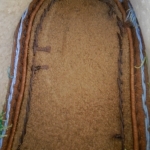 For the binding stitch I used waxed linen thread, and for the embroidery and enforcing stitches I used cotton threads. The buttons are made of glass beads. 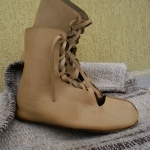 The shoes` size is 40-41 by European size standards (6,5 t0 7,5 British sizes and 7-8 by american standards). Call us if you’re interested. 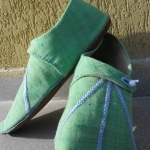 Futhermore we take orders for custom hand made shoes – any design and decorations you like. 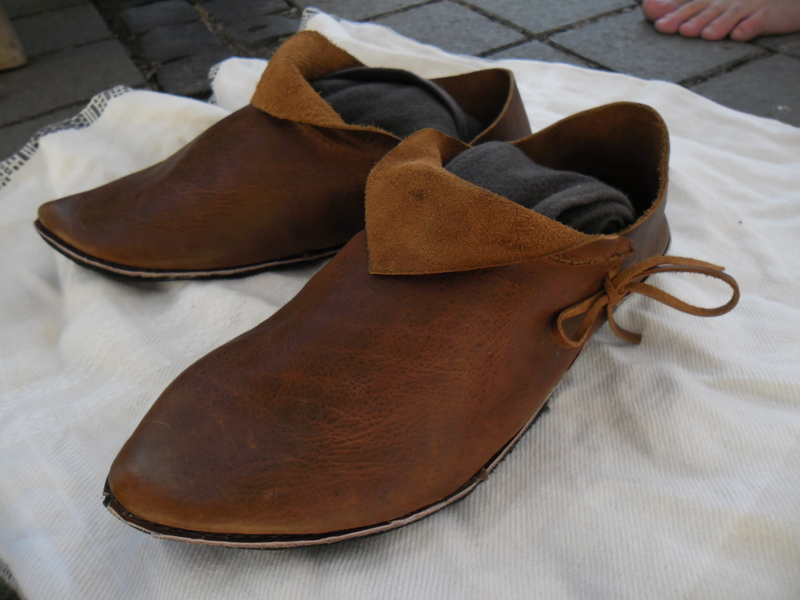 It seems like this particular model of turnshoes was pretty popular in medieval Europe. 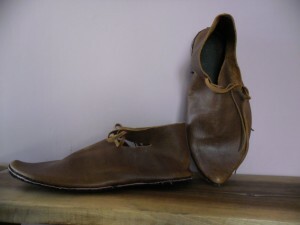 This type of turnshoes are typical for western Europe, but are not uncommon to the kingdoms on the Balkans as well. 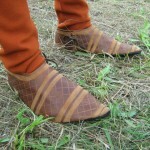 We have a couple of frescoes and murals depicting this exact type of shoes. Here you can see two pairs of the same model. 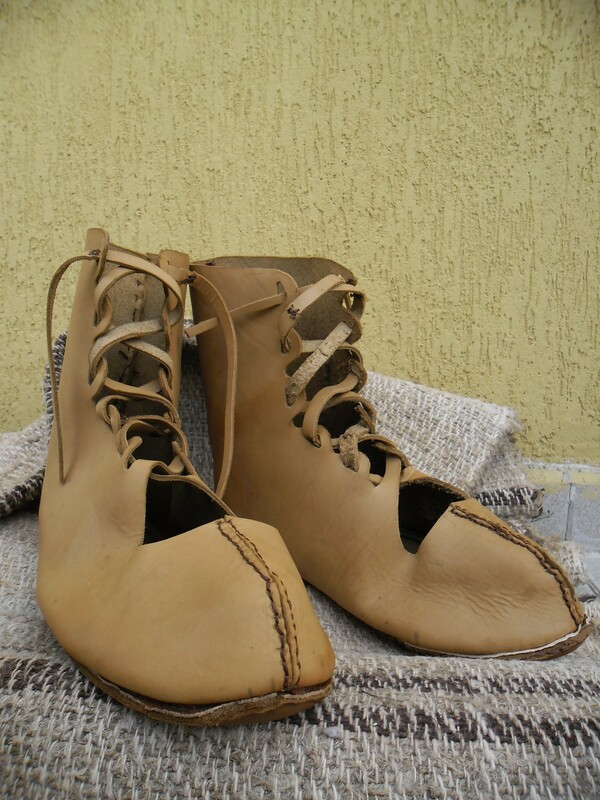 The female model has only one leather sole, while the male version has 2 layers of leather soles. 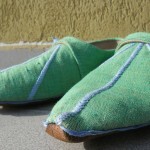 Both pairs are made of a sole(5mm thick ) and upper part(2mm). 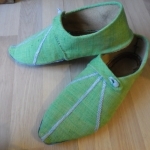 They are hand-sewn with waxed thread.